Don't let JamesR see this. He's been talking about becoming and English Major and you are worried about this? I think you might only care about yourself. He was wishing in another thread for a Jesus with more-Islamic qualities. St. Feodor Ushakov is a glorified saint in the Russian Orthodox Church. He was an admiral and is depicted as such. St. Isaac the Syrian is definitely an Eastern Orthodox saint. He was anathematized by the Nestorians who took over the Church of the East after 780 when Catholicos Timothy I came to power, for preaching Orthodoxy, specifically, deification. He's hard to keep up with apparently. 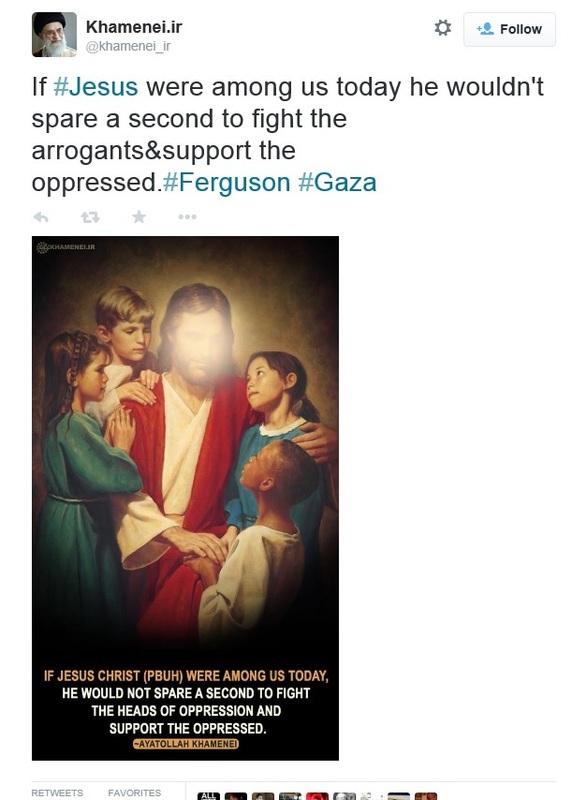 I'm somewhat surprised he would cover the face, considering that Shia are not against iconography. I'm surprised he's using Christ instead of just Isa or Jesus, and that Americana style painting -- definitely trying to win over people. The other day, I received two "schlocky" icons from my ex mother-in-law. My ex-wife, over the New Year's holiday, apparently bought them from a flea market at an outlet mall - even though there's an Orthodox monastery about 30 minutes from where they were staying (neither didn't know about the monastery's existence at that time). The first one is of the Holy Family, except St. Joseph looks like an adult Christ rather than an older man. I tell my mom that the icon is schlock; however, she insists on keeping it. The second is a key chain depicting the Virgin with Christ child - except there's something (an angel?) holding a cross in the upper right corner of the icon and another angel (?) holding something in the upper left corner of the icon. That description sounds like the perfectly proper Mother of God of the Passion (Strastnaya, Amolyntos). The Roman Catholics call it Our Lady of Perpetual Help, and there's hardly an RC church anywhere without one. OTOH, the Holy Family picture does sound like schlock. Any chance of taking a picture of it some time, and posting it here? Upload the picture onto an image hosting site, then post the URL. Just as I suspected. Completely unsuitable for Orthodox veneration. Because St. Joseph is in it? What if it were like a normal icon of the Theotokos and Christ-child, but with St. Joseph standing beside them (with traditional grey hair)? Okay, is it that you find babies creepy, or realistic babies creepy, or realistic baby Jesuses creepy? Beamed up shoulder flesh is causing some "difficulties". I'll admit that it looks like her ever-virginity is falling onto the chair. When I said "inspired," I mostly meant the posing. I like St. Joseph's eyeglasses. He looks quite distinguished. Realistic babies that stare at me like an adult are creepy. Tiny-30-year-old Jesus only works for me in the relative abstract of an old fashioned icon. No, but how he is portrayed, in gesture and appearance. You don't think he ever hugged the Theotokos or Christ? He raised Him as his own. I thought Orthodoxy was all about the legitimacy of sexless marriages. It has nothing to do with the Perpetual Virginity. You know, Volnutt, you've been around here so long and you often post with such a breadth of knowledge, and then you come out with something like this. Even a novice knows an icon impictures theological and liturgical truths, and positions and gestures are important parts of that. Sexless marriages would be something very odd in Orthodoxy (if we discount St. John of Kronstadt and his frenemy Mr. Tolstoy ). I know they do. 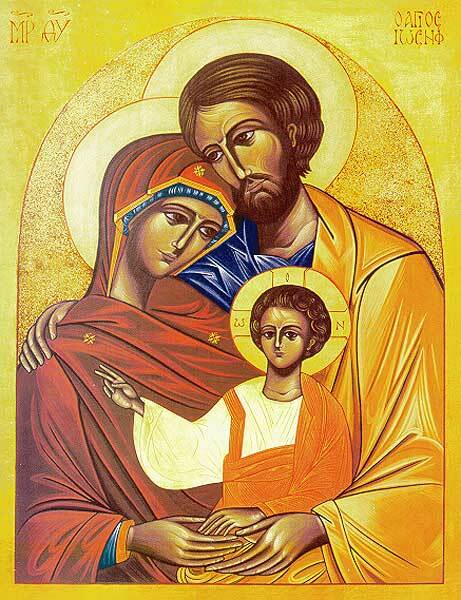 I'm saying that such an icon can be a nice picture of the love St. Joesph, the Theotokos, and Christ had for one another as a family. I don't like the antiseptic nature of St. Joseph's portrayal in icons. And I'm pretty sure there were more men and women who "lived together as brother and sister" than just the two you mention. No doubt there were, but that's not the point you made. If you "know they do," then how can you simultaneously expect an icon to be a "nice picture of ... a family"? Don't you think there might be some unfortunate theological meaning in the Christ depicted "in" both SS. Mary and Joseph? Icons depict theological spiritual realities, and also express in visual form what is expressed in what is read, said and sung in the hymns and prayers of the Church. The depiction above of St Joseph, while perhaps acceptable in other Christian denominations, is not at all in keeping with Orthodox teaching or iconographic tradition. There are many reasons why you shouldn't, from the liturgical, doctrinal and theological standpoint. It presents St Joseph in a way which is not the way Orthodoxy regards him. The NIV Bible is not translated from the Septugint and it's a poor translation, but I'm not going to chuck it on the floor. I still show it respect because it is the Holy Scripture. The icon might not be ideal, but I don't think an icon has to be perfect for me to venerate it. When a painting that looks like an icon presents a major distortion of what the Church teaches and believes, then it should not be venerated. Would you think it proper to hear a hymn or prayer during a church service which has been "creatively" tweaked to reflect a personal opinion which conflicts with what the Church teaches? Do you think it OK for a hymnographer to take such liberties? Honest ignorance is one thing, and it can be corrected, as I have said many times on this forum. Willful perpetuation of error, however, is quite another matter. We are expected to be vigilant. I'm not sure I would agree with the characterization that it presents a major distortion. If you take up my offer (available to all forum members, not just you) of my emailing you a document on the proper iconography of St Joseph the Betrothed, you will see why the above image is indeed a major distortion. I do not understand what you are driving at. I see no unfortunate theological meaning. "Nice picture of" reads like a photo op, which is not the case. The depiction above of St Joseph, while perhaps acceptable in other Christian denominations, is not at all in keeping with Orthodox teaching or iconographic tradition. What Orthodox teaching is this not in keeping of? Icons are not the final word of Orthodox teaching. I am curious as to what you are referring to. Icons are not the final word of Orthodox teaching. Just as the hymns and prayers of the Church express what the entire Church teaches in words, so do icons, in visual form. Icons do, and must, express what the Church teaches. They are not vehicles for the whims and fancies of artists. What Orthodox teaching is this not in keeping of? Posting a twelve-page document on the forum won't make me very popular among the admins. I would be happy to email it to you, though. Father in the temporal, "social" sense only. Icons are beyond what is worldly. At a hazard, that is, as nobody educated but still someone observant, I would say the positioning of the Christ in relation to the Blessed Mother in the various very-important very-traditional icons of them has theological meanings. To then take that positioning and put in relation to St. Joseph might impute a variety of bad-theological meanings to him -- Does the Christ come forth from St. Joseph in any way? Was the special saintly role of St. Joseph to present the Godman to the world? and so forth. Was the special saintly role of St. Joseph to present the Godman to the world? It is noteworthy that in icons of the Meeting of the Lord, the order of the figures are thus, from right to left: Symeon holding the Child, then the Virgin, then Joseph holding the two turtle-doves. It is also the Virgin who is seen presenting the Child, not His earthly father, the reverse of what would have actually happened under Jewish custom. This detail is neither random or accidental. The hymns of this beautiful feast clearly proclaim this, and expand on its significance. In some compositions, Righteous Anna the Prophetess stands next to Symeon, in others, she is behind Joseph, and in some she stands between the Virgin and Joseph.